In 'Security Analysis of India’s Electronic Voting Machines', authors Hari K Prasad, J Alex Halderman and Rop Gonggrijp state clearly that "the Election Commission of India developed the country’s EVMs in partnership with two government-owned companies, the Electronics Corporation of India (ECIL) and Bharat Electronics Limited (BEL)...second-generation models were introduced in 2000...these machines moved the firmware into the CPU (Control Processing Unit) and upgraded...other components..."
Wikipedia defines Firmware as "a specific class of computer software...that provides both standardized operating environment for the device's more complex software (allowing more hardware-Independence), or, for less complex devices, act as the device's complete operating systems, performing all control, monitoring and data manipulations functions..."
Consider this: Firmware is a basic code written in C to do operations. Is this code vulnerable to manipulation? The code doesnt change anything while voting or at any stage before counting. So, if you look at flaws in any process you wont find any. The code runs only during counting of total votes. So, if the code is manipulated, it tries to favour, say, ' party X', over other parties... when the counting begins, it checks for party X versus votes other parties. The code is usually manipulated or set to start working only if the margin of difference between X and other parties is say 10% or 15% ... or else, it will not do anything. The margin is decided by the hacker’s boss and can be any number. Also, there is a threshold limit, set say, above 20,000 votes. The code is set in a manner that it gets activated only when it reaches the threshold level. This way the code escapes detection at the trial level when few votes are cast and their total is tallied to test the machines. The threshold level works in a way that if 'party X' is not near the threshold level, the code does not start working! This answers queries of those who say, if EVMs are being hacked, why doesn't 'party X' win all seats! If the margin condition is met, the manipulated code does the following: reduce votes of others in proportion and add to party X. If party X is still losing, the manipulated code can take votes from others contenders. Now, this explains why Independents lose maximum votes, and some even get zero, in such a scenario. 'Getting zero' is actually a bug in the code. Here, the 'if' condition has not been programmed fully to check that the code doesn't reduce vote of the party it attacks to zero. The C code firmware is present in all machines before they are sent to polling booths. So the hacking is done at the level of manufacture. Surprisingly, Election Commission (EC) verifications confirm only that all machines are using the same software version. It is not EC's job to check the firmware code. EC just uses the machine as supplied to them with whatever code inside! EVM firmware is stored in masked, read-only memory inside the microcontroller chips, and there is no provision for extracting it or verifying its integrity. This means that if the firmware code was modified before it was built into the CPUs, the changes would be very difficult to detect. The software/firmware is integrated into the CPU by the manufacturer, Renesas, a Japanese company (other EVM models use CPUs made by Microchip, an American company). The afore-mentioned scholarly paper states that "consider the engineer responsible for compiling the source code and transmitting it to the CPU manufacturer. He or she could substitute a version containing a back door with little chance of being caught. This fact alone would be great temptation for fraud!" Scholars go on to add that "similarly, employees at the chipmakers could alter the compiled program image before burning it into the chips. While more involved than modifying source code, reverse engineering firmware of such low complexity is not difficult and has been done (sometimes within a few weeks) with other voting systems in the context of academic research..."
Now, let's take the case of Rajkot West where BJP chief minister Vijay Rupani was contesting. At around 10-10.30 am the Congress candidate was leading by exactly 15% margin over Rupani! This is where the firmware code began attacking votes of independents and other smaller parties, taking them towards the BJP candidate. Suddenly, Rupani started getting votes, while other candidates began losing votes. My sources inside the Rajkot counting room say that after each hour, 15% votes were added to Rupani's kitty. What do you see in the screenshot below that gives you the results of Rajkot West? That there were 5 Independent candidates -- three of them polled less than 1,000. One polled less than 2,000. BSP, the only recognized party, polled 1,400 votes. Other, obscure, small parties got less than 1000 votes. The NOTA mystery also gets solved in Rajkot West. With all parties barring Congress and BJP getting minuscule votes, NOTA polled 3,251, second only to the Bahujan Mukti Party, which polled 4,122 votes. If you see the pattern of NOTA votes overall, they are significantly higher in areas from where the Congress has won. NOTA votes dip when BJP wins! So, a pattern emerges; in about 26 seats where BJP feared losing, the number of Independent candidates is high. In the early stages of counting, these independents got good votes. Then their votes started getting reduced! NOTA votes seem to increase where BJP is seen in the beginning of counting as doing badly! a). Why the BJP vote share is abnormally high? How is it that had Congress got 3,000 more votes in 16 seats where it lost by a margin less than 3000, it would have, while still at a vote share of 41.4% roughly, and 8% behind BJP, got 93 seats, and formed the Government! b). Remember, the EVM is hacked not through bluetooth or at the polling stage; the scenario that machines showing the BJP symbol when voters are pressing Congress symbol is not covered in this schematics! 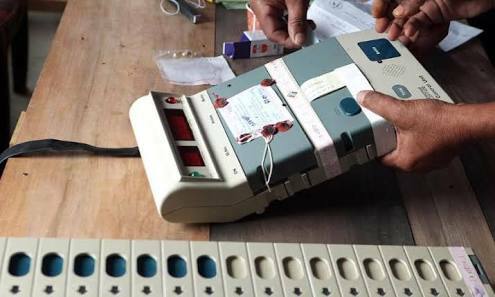 EVMs are hacked only during counting, through pre-determined setting of codes in firmware. c). Was the EVM hacked in the 16 seats where Congress lost by less than 3000 votes? No, EVMs were not hacked through pre-determined codes in those 16 seats. The manipulation on these seats was done manually, on the counting day, by scaring counting agents and making BJP win by force! d). EVMs were hacked through predetermined codes in constituencies where BJP votes are abnormally high, like above 80,000. In these seats, invariably, BJP candidates started winning after trailing by 15% margin! See the Surat seats... and Mehsana! e). Arvind Kejriwal knows the truth. But his demonstration of EVM hacking, conducted inside the Delhi assembly, did not address the firmware issue...and how hacking takes place only on counting day! f). The book written by BJP's Narsimha Rao also avoids the issue. g). It is now clear that international forces are involved in EVM hacking in India! h). It is not Pakistan but the US lobby, including Japan and Israel, that is subverting Indian democracy! i). So the EVM hacking thing is not just a technical problem. It is not a live political issue. Congress is the only party that is standing up to US pressure. But the rider is that with the whole Indian establishment infiltrated by the US-Israel-RSS triad, Congress has to compromise and step back from confrontation at intervals. j). The real problem is the lack of a real civil society movement, of people hitting the streets on this issue. But people are unaware. With all propaganda channels blocked, there is no way things can be put across to the people of India.